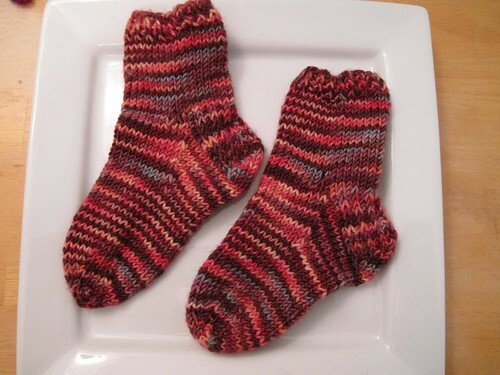 There is something so satisfying about knitting kid socks. I think it's just the novelty of knitting a pair of socks in just a few short hours. These are for Jenna, one of the three kids I babysit from time to time. I made her try one on to see if it fit. She was super pleased at thought of these socks. And, for a girl that is turning three this week, I am impressed and thrilled by her desire to acquire handknits. The Pattern: One that is in my head. 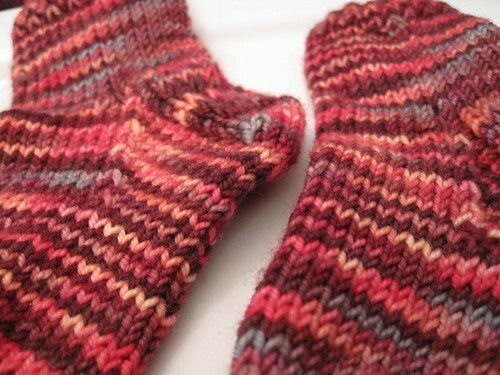 I measured Jenna's foot, did some math and knit a cuff done sock with a heel flap. The Yarn: Blue Moon Fiber Arts Mediumweight Mill End. I have no idea what color that was supposed to become. The Time to Knit: 2-ish days.